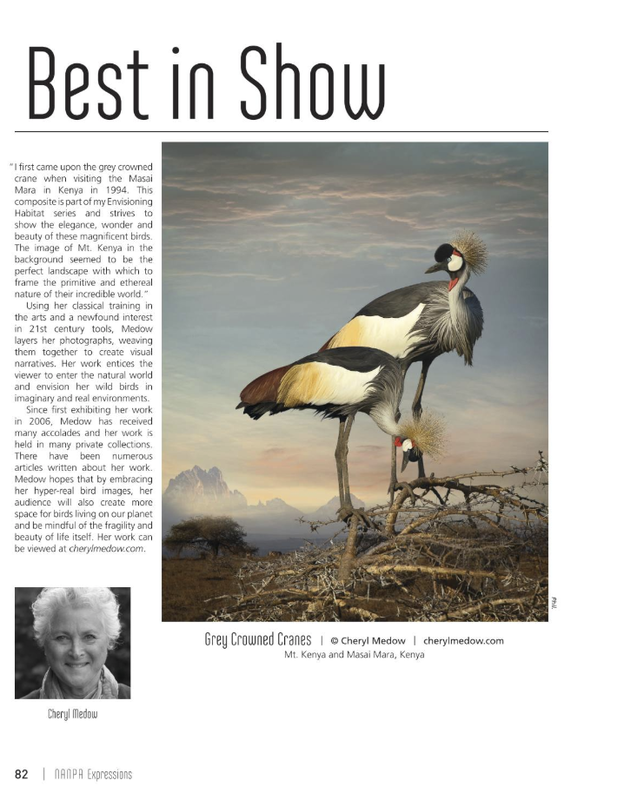 Showcase NANPA (North American Nature Photography Assocation) - Expressions Magazine 2018 - featured Grey Crowned Cranes receiving Best Of Show - and Two Snowys the Judges' Choice Award. Other images from my Envisioning Habitat series included in Expressions 2018. 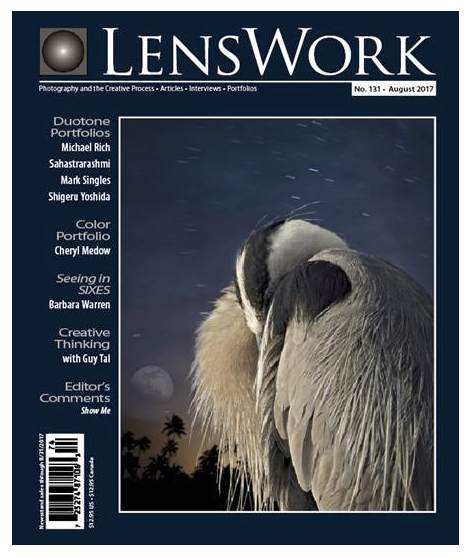 I am proud to be on the cover and included in Brooke Jensen's award winning LensWorks for the August issue #131. If you don't know this 96 page book, check it out. The premise of LensWork is that photography is more than mere craft. Photography is, or can be, a way of life. LensWork is a 96-page, 8½x7” paperback periodical — a book-quality, paper-based, anthology-style bimonthly publication. November 29, 2015 Article in Slate.com by David Rosenberg Bring The Background Into Focus In These Stunning Photos of Birds. At first glance, Cheryl Medow’s highly detailed images look like real landscapes, but it soon becomes apparent that something more unusual is going on. To create her ongoing series Envisioning Habitat, Medow first photographs birds and landscapes in the United States, Africa, Europe, and South and Central America. Then she constructs an entirely new reality out of those original photographs, resulting in the art you see here. July 12, 2015 - Sunday Still Issue 43 was on Proof National Geographic. Medow's work evokes the paintings of Martin J. Heade. June 30, 2015 An article for National Geographic Proof Picture Stories The Art of Birds Seen Through An Altered Reality written by Becky Harlan appeared online with great success. Fabulous! Almost like being in a dream! Stunning! I would be thrilled to have any of these on my walls. I love your work, so creative, so beautiful. One can spend a long time with these images, enjoying them. White Ibis With Fish made me laugh. ..Thank you, you have no idea what your talent has brought into my world. I suffer from TN which causes the most severe facial nerve pain on the right side of my face.I do visualization therapy for the pain, I am in severe pain now. When I discovered your magnificent birds. They are so detailed and so alive. I have focused on every detail until I felt as I was there caressing their soft feathers. You have helped my pain tonight and for sharing your art with the world and bring it into my world I am truly grateful. I have added these photos and your site to my photos I use for my therapy. .. This is the closest photography can come to photorealistic painting as in the Audubon collections, which appear to some extent to have inspired these pictures. Admirable photoshop techniques and, knowing that each part of the image was still photographed somewhere in the wild, immensely beautiful pictures, reminiscent of a world intact and wild long gone. It is like a look into the past of earth history to warn what mankind will be losing – or already lost – in the future if care to preserve the planet is not taken. Yes!! At last someone broke through that old glass ceiling to reveal emotion, art, beauty all rolled into one magnificent image. This is what I want to see and for those purists out there, I do not care how it was done! I did try this myself and was not brave enough to swim against the tide of hackneyed opinion, now I will revisit it because this is a wonderful breath of fresh air. J’aime la forme d’esthétique que vous recherchez et que vous avez atteint. I looked with tears in my eyes at each photograph, each one a work of art. I just returned home and saw this email. While I was out, I pulled off the road to watch a family of Sandhill Cranes (Mom, Dad and juvenile). I intentionally drove by that area hoping to see them, the parents have lived around there for years. I can’t think of anything to watch that is so calming. Thank you for the beautiful pictures. 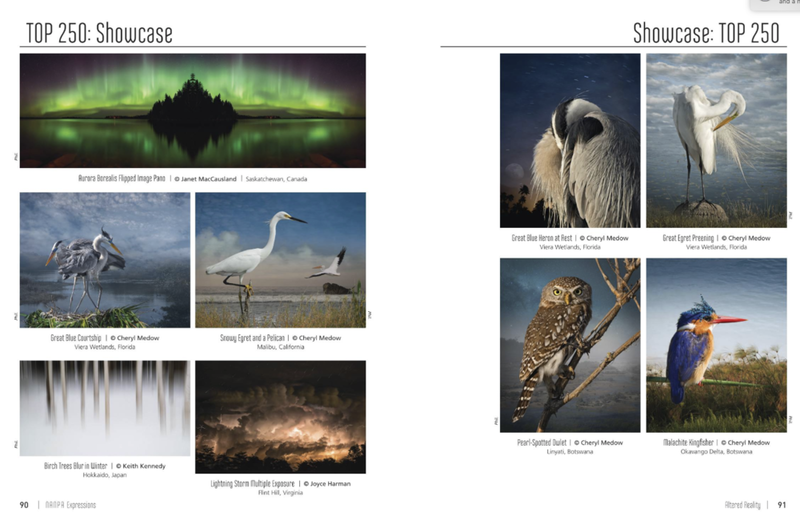 As a nature lover and a recent visitor to Ding Darling on Sanibel Island, these images truly are ethereal.